into contact with corneal tissue, it is necessary to preserve against contamination by utilizing only the purest and safest ingredients. In both human and veterinary ophthalmics, one of the most common and effective preservatives is Benzalkonium Chloride (BKC / BAK). Our FeF™ Benzalkonium Chloride is widely used as an excipient in ophthalmic solutions, gels and ointments, where its concentration typically varies from 0.001% up to 0.2%. The different alkyl (fatty) chain lengths give Quats different properties. For example, antimicrobial activity is greater for shorter chain lengths, however skin sensitivity decreases as the chain length increases. Shorter chain lengths are more soluble, and they also foam more. The alkyl chain length distribution often plays a major role for ophthalmic formulators. 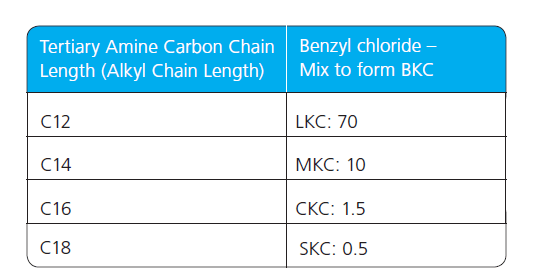 Our production and process know-how allows us to offer Quats with a completely well-defined alkyl chain length distribution, whether it is with our standard chain length or with customized chain length distributions. max. 5% of C16. We also offer other chain length distribution products or can develop your own, customized product. Solubility decreases as the alkyl chain length increases. Compatibility: Mixing BKC with ordinary soaps and/or with anionic detergents may decrease the activity. As Quats are cationic compounds, they should not be mixed with anionic compounds which would have a neutralizing effect. Quats can be inhibited by Tween™ and by lecithin. Avoid mixing Benzalkonium Chloride (BKC) with citrates, iodides, nitrates, permanganates, salicylates, silver salts and tartrates. Incompatibilities have also been reported with other substances including aluminium, fluorescin sodium, hydrogen peroxide, kaolin and some sulfonamides. Hyaluronic acid can minimize BKC’s irritating effect. FeF™ Quats are effective at all pH levels. However their effectiveness increases when the pH increases. The higher the pH, the lower the concentration needed to obtain an antimicrobial effect. As opposed to bacteriostatic/fungistatic compounds which only prevent micro-organisms from dividing (growing), Quats are bactericidal/fungicidal meaning they will kill micro-organisms whether they are in a growth phase or not. 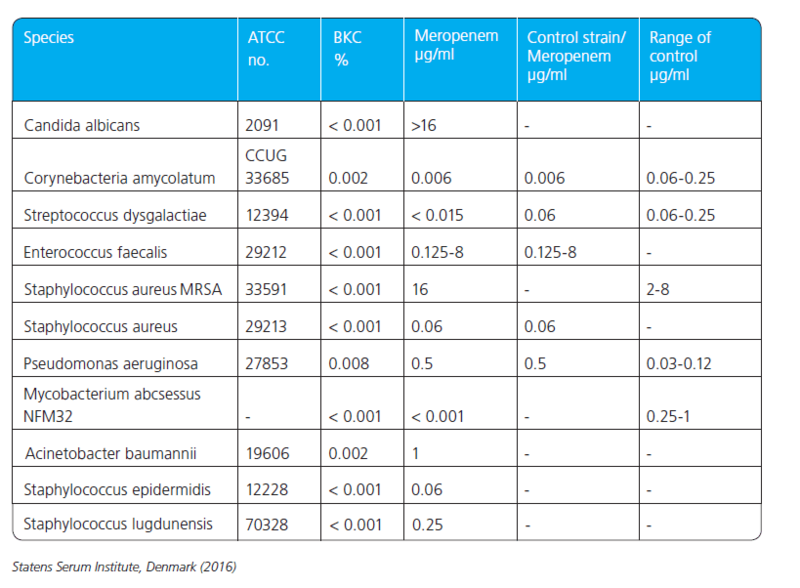 FeF™ BKC has been tested against several relevant microbial strains, and shown to be effective against a wide range of microorganisms at low concentrations. FeF™ BKC is compared here with ethanol and with a positive control containing Meropenem (a broad-spectrum antibiotic).